Oh My Gosh, what a stunning card! The flower is beautifully cut out! Amy WOW this is beautiful, I SOOOOO LOVE that added lace too, GORGEOUS! This is so pretty Amy... you did such a fabulous job with this! Love your fancy font in your sentiment too!! =) Lovely card!! Amy, this is absolutely gorgeous! Love how it all goes together, and the flower, though painstaking to cut out, looks fabulous silhouetted against that wonderful paper. A beautiful card!! This is the card I came to comment on but I found so much more on your blog. 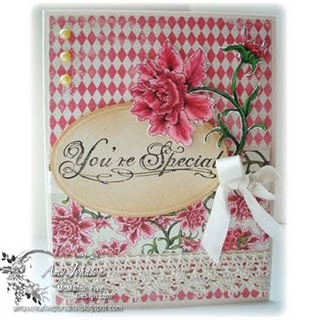 You are very talented and have some beautiful cards with great design principles and lovely papers on them. Thank you for sharing your gift.